From Square Enix. 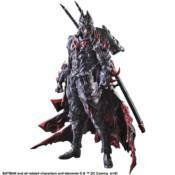 A new Play Arts Kai series that transcends time and space. Legends exist regardless of the time. Through generations, there has always been a force of justice that agents of crime, chaos and evil have contended with. Every incarnation of Batman that existed throughout time stood as a beacon of hope and a reflection of the age it is a part of. Utilizing and innovating the technology available, Batman is ever vigilant even in lawless times. Now a new entry joins the ranks, its concept derived from the samurai spirit of bushido, 'the way of the warrior.' The figure also includes display stand and interchangeable hand parts.